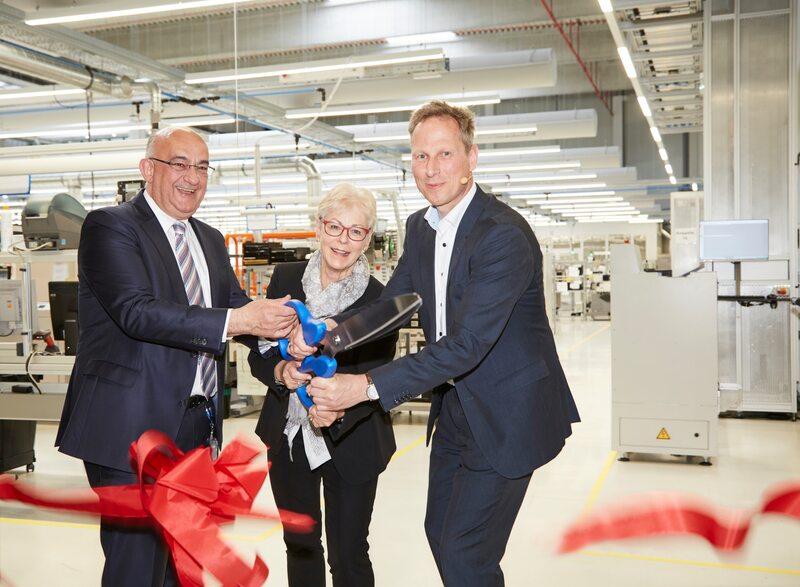 Waldkirch, May 2018 – The e-card production facility at SICK’s Reute site was inaugurated with a ceremony on Friday, 4 May 2018. The extension building was finished in February 2018, having taken about one year to build. The transfer of SICK’s entire e-card production from Waldkirch to Reute was achieved within less than three weeks. Production started at the end of March. Smart services are used in the new unit to enable transparent and efficient production processes. In addition to the extra production capacities, office space has also been created for production-related activities such as production planning and logistics. The new production space in the three-storey building totals about 3,600 m², and another 1,500 m² has been set aside for offices. More than EUR 11 million were invested in the project. “SICK has been firmly rooted in the southern Baden region for more than 60 years. This expanded production at the Reute site is a consistent and important step towards securing the worldwide growth of the SICK Group,” explains Dr. Robert Bauer, Chairman of the Executive Board of SICK AG. The company is also planning to invest about EUR 500,000 in expanding the parking area, and two neighboring pieces of land have already been purchased for this purpose. Construction of about 110 parking spaces below the existing car park was completed in early April. Further pieces of land are to be converted to parking areas during the year. Transferring e-card production was a magnificent logistical achievement: The entire unit moved from Waldkirch to Reute in just 18 days – with running operation and without any production stoppages. This involved 255 workplaces and about 200 machine and production computers. About 1,650 different printed circuit boards (PCBs) are produced, totaling approximately 5.2 million units per year. The new e-card production unit in Reute also exploits smart services. They can be individually programmed with digital sensor and machine data, enabling the visualization of running production processes. The increased efficiency achieved with the help of smart services is an important factor. Intelligent data management supports increased transparency along the entire value-creation chain. The clear view of the individual processes enables them to be specifically further developed, and their efficiency monitored via performance indicators. 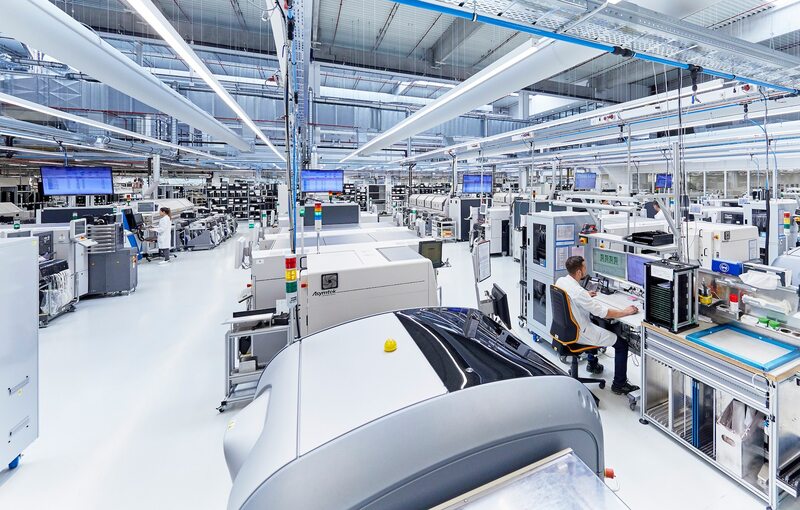 Intelligent services supporting e-card production at Reute are used to visualize the paste printing process, as well as to digitize both setup optimization during assembly and condition monitoring during soldering. The potential uses of smart services are limitless: The visualization of all process parameters allows extremely precise process forecasting and proactive machine maintenance. SICK will be expanding its portfolio as a sensor and system supplier with data-based services. With more than 800 employees, the Reute works is SICK AG’s second-largest site after the headquarters in Waldkirch. This is where SICK produces gas analysis systems for monitoring the waste gas emissions of power stations or for the resource-conserving control of chemical processes. Systems for automating logistics are also produced here, e.g. for flight baggage identification at airports. The third field of production at Reute is the pre-assembly of housings and glass optics, among other things, for sensors. Reute is not just a production site for SICK, but also the home of several business units working on development, sales and administration. Dr. Robert Bauer and Renate Sick-Glaser inaugurate the new Hall with Bernhard Füger, Vice President Electronic Production. Intelligent data management enables efficient and transparent production processes. 255 workplaces and about 200 machine and production computers were moved in less than three weeks in what must surely be a record.